One of the most difficult tasks for a leader is getting a new media volunteer (and even staff) trained, up to speed on your systems, and ready to go solo. Here are 3 Secrets that we have found to be extremely helpful in this process. When merging into traffic on a busy highway, a long on-ramp is extremely helpful to allow your car to get up to highway speed and blend into the flow of cars. When you find a person interested in serving on your media team, don’t just throw them in a chair and have them start. Help them know there is going to be a several-week process to allow them to observe, ask questions, get the big picture of the weekend production, and have lots of time to get comfortable in their new role. Some volunteers need longer on-ramps than others, but all volunteers (and even staff) need some sort of on-ramp to merge into your production flow. A systematized on-ramp program will prevent crashes that often are fatal to a volunteer’s serving career. 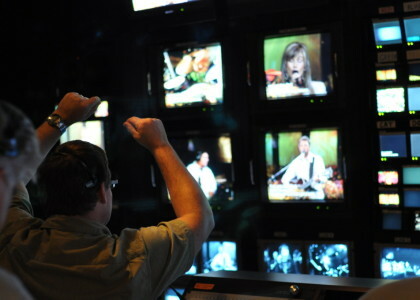 Church media is part science/technology and part art form. Teaching the technology part is relatively easy. Push this, click that, turn this, watch that. What is really difficult to teach are the intangibles. The subtly that makes all the difference to success. Where do you place your hand on the keyboard? What part of the screen to you look at to follow lyrics? How did that operator know the worship leader was going to repeat that instrumental intro? As your new volunteer works her way down the on-ramp (see secret #1) having highly skilled, “gold-standard” volunteers to train your new volunteers (and even staff) allows for a consistent transfer of team DNA and culture to new people. We have a volunteer video engineer who is responsible for training every single new engineer we bring onto the team. Richard has created his own training manual and teaches every new “student” his way of doing things. He teaches them to take a tissue to the pastor and ask him to wipe his forehead to remove excess oil that causes shine, he teaches them how to communicate they are rolling and recording. Some volunteers even holler, “Recording!” just like Richard does. Not only does Richard, our “gold-standard” video engineer, transfer our team culture, procedures, and the nuisances of the job, but he also frees up staff members from being responsible for training every new engineer. In gymnastics, even at the olympic levels, there is a quiet, and often unseen, team member who never gets a score; never gets a medal. It’s the spotter. The spotter is the one who quietly walks out to the mat just before a complex portion of the routine and makes certain that the gymnast doesn’t end up with a broken neck if a hand slips. I can only imagine the level of confidence this brings the performer – knowing if something goes wrong, there is a safety in place to protect them. As a new volunteer (and even staff) moves along the on-ramp (see secret #1) and learn all the intangible secrets from our “gold-standard” volunteer (see secret #2) they eventually are ready to find their spot in the flow of your ministry. They are ready to go solo. This is the scary point for both you and the new team member. This is the point of glorious flight or crash. But, there is a secret to making the solo phase go great. That secret is have one of your “gold-standard” volunteers move into a spotter role. They provide oversight of the whole process and only step in if there is an emergency that could cause a crash. This past weekend, a new staff member (yes, staff) was soloing as the Graphics Director. This is a high-capacity roll that provides direction and oversight of our two graphics operators. The job must know our graphics software well, must be able to coordinate with the Video Director seamlessly, and must be able to flex everything when the unexpected happens. All systems were “go” for Sarah for her first service and everything was going great. Until the teaching pastor walked up to intro a communion element before the song was over. She had graphics operators in the middle of the song and live on screens. She had to make a call, but was new enough that she didn’t know what the best course of action would be. In steps the spotter – Christy. Christy calmly steps forward. She quickly gives clear calls to the two graphics operators so they know exactly what to do, then tells the Video Director everything is fine and these are the next steps. For Christy, with her experience, this was a non-event because she knew what all the ramifications of her calls would be. For Sarah, that would have been a crash that would have made her feel like she had failed to anticipate the error of the teaching pastor. On-Ramps, volunteers who train other volunteers, and spotters; three powerful tools to give your new volunteers the very best chance for success.